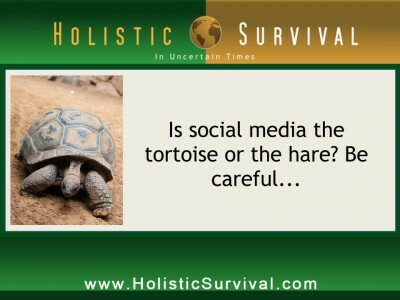 A five-year old article posted at TwistImage.com made us here at Holistic Survival stop and scratch our collective heads. The author (Mitch Joel) decided to turn conventional wisdom around and look at the slow benefits of engaging in social media. The very thought of removing your foot from the marketing accelerator probably caused a good many of you to throw up in your mouth a little just now. For those still reading, let’s take a moment to appreciate how media like Facebook, Twitter, blogging, and podcasting might yield more results when approached at the pace of the tortoise rather than the hare. That’s pretty powerful marketing stuff there. Maybe we should consider the entire spectrum of social media as simply a new line of tools to get the job done. There never has been and never will be a substitute for doing the grunt work of establishing relationships with people. Sure, you can throw a podcast up and sit back waiting for your cash register to start ringing up the sales but you are unlikely to be rewarded so quickly. Try putting your nose to the grindstone and cranking out a dozen shows, then a hundred, then a few hundred. The momentum of a growing archive of content should not be underestimated. Joel mentioned in his blog that Chris Anderson, editor of Wired.com, said over half of all the website’s sizable traffic was to the archives. This means that at least half the people are not stumbling here and there in search of the latest, most fascinating news tidbit about Kim Kardashian. On the contrary, they’re seeking out nuggets of gold from the mountain of information. Throwback Thursday – Remember What the Constitution Says?